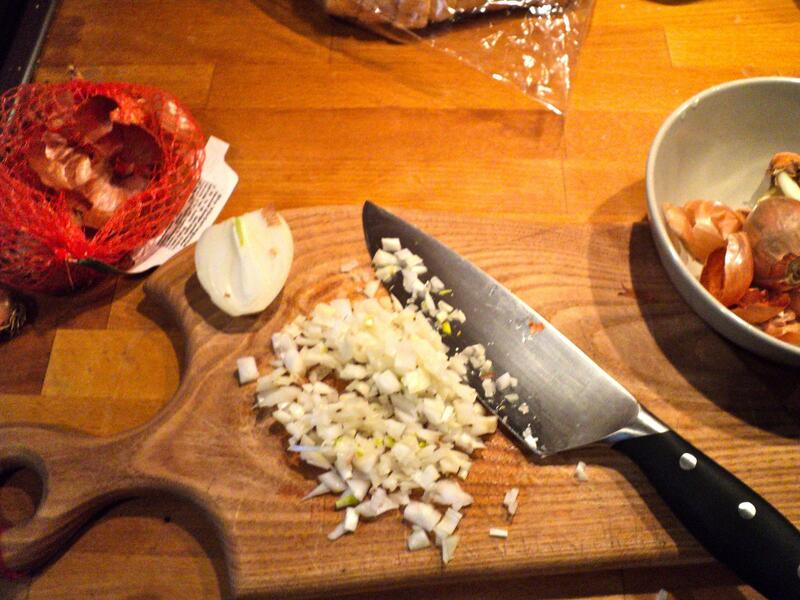 For a delicious meal: Take a small onion, or half of a medium one. Chop it up finely. And stir until well-mixed. Add water to cover and cook the rice until al dente. Mix rice with some ground pork, salt and pepper. Stuff eight small peppers (or four bell peppers). 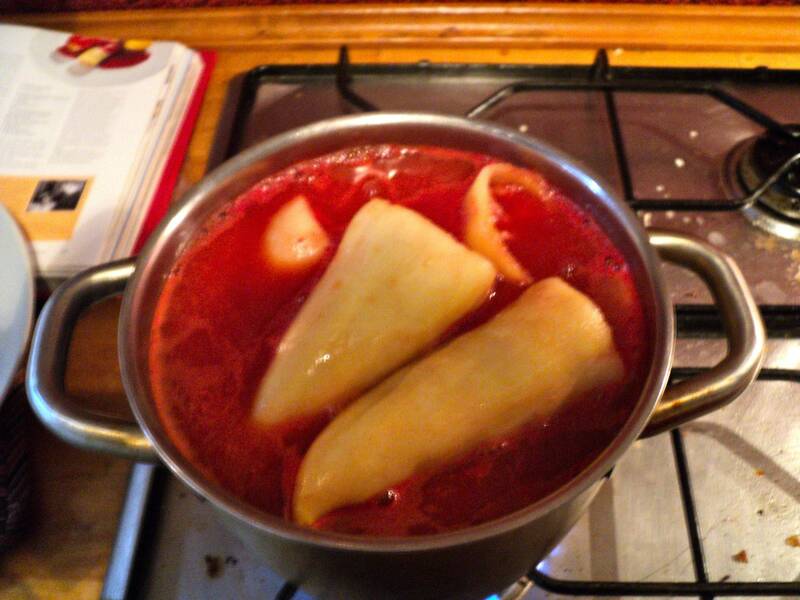 Bring some tomato juice to a boil, and add the peppers to the pot, making sure that they are mostly covered. My pot was so small I could barely fit all of mine and had to stir it every so often to make sure the peppers on the top cooked all the way though. When the peppers are done, fish them out of the tomato juice and set aside. Bring the tomato juice to a simmer, and make a paprika-butter roux to thicken it. Pour the tomato sauce over the peppers and serve. This dinner was amazing. So yeah, it takes a while. But if you start it at 4:30, you can easily have dinner by 6 if you organize your life. For god’s sake don’t use those awful green bell peppers though. If you have to use bell peppers, buy four yellow ones. If you really hate cooked peppers, I suggest you make two-inch meatballs and boil them in the tomato sauce, then thicken the tomato sauce as directed. 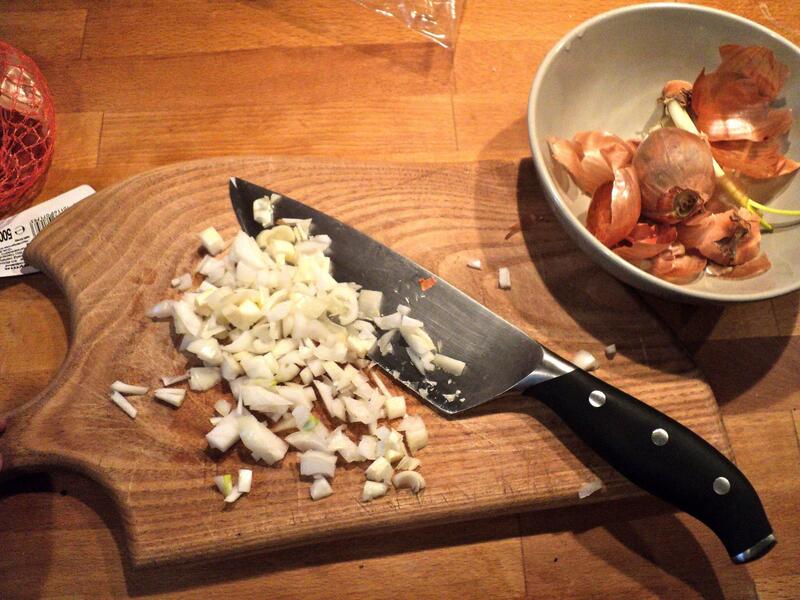 Dice the onion very finely and heat some oil at the bottom of a saucepan. Add onion and a bit of salt and stir, cooking until onion is translucent. 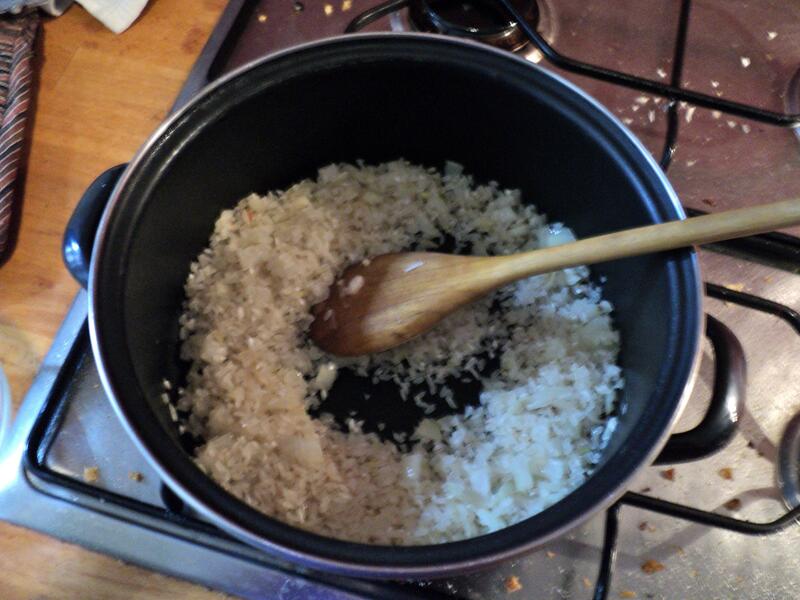 Add rice, and stir until grains are coated and slightly toasted. Add 1 1/2 cups water, bring to a boil, then cover and cook on low heat until water is absorbed, about 15 minutes. Scoop onion-rice mixture into a large mixing bowl and set aside. 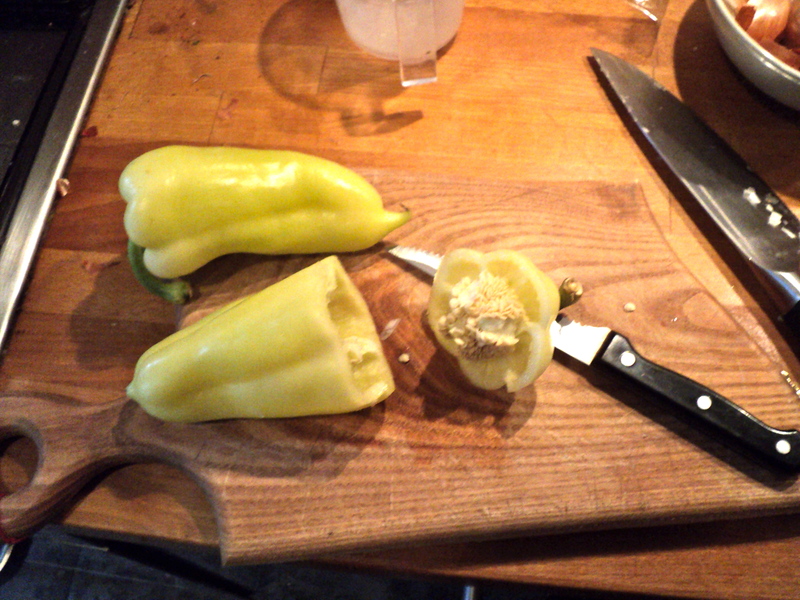 Cut the tops off of the peppers and remove core, seeds, and white ribs from the interior of the peppers. 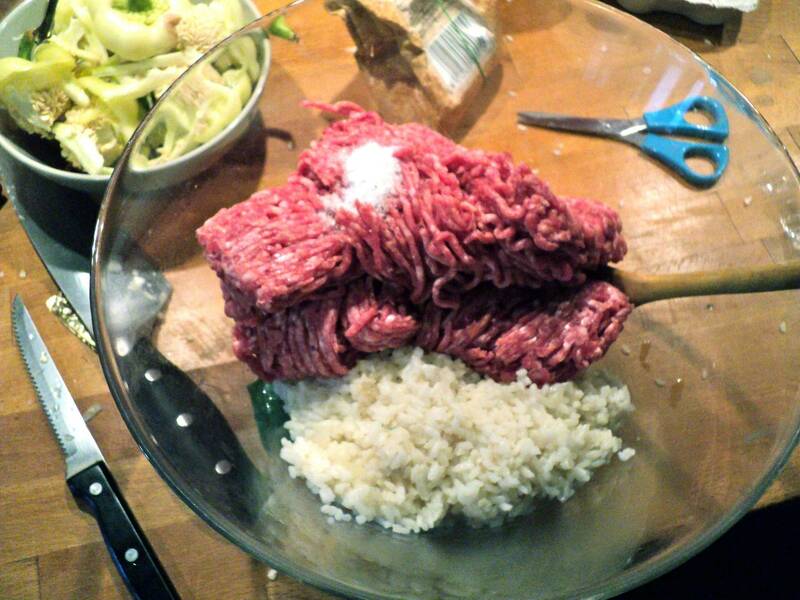 Add the ground pork to the rice with a generous two teaspoons of salt and mix well. Stuff the peppers, leaving a few centimeters of room at the top as the filling expands. If you have any filling left over, you can roll it into small patties and either boil them with the peppers or fry them separately (I fried mine). Bring the tomato juice to a boil (this is also a good time to start boiling water for the potatoes if you are making them). Pour the tomato juice over the peppers in a pot large enough to hold all of them and the meatballs, if you plan to boil them. Add enough water (≤1 cup) to just cover the peppers. Bring to a boil, then cook for 50 minutes over low heat, partly covered (I like to wedge a spoon handle under the lid to prevent boiling over). Meanwhile, you can skin a small potato per person and bring them to boil in salted water, partly covered. This is optional, but the potatoes go well with the sauce and make the dinner more filling. When the peppers are done, carefully remove them from the tomato juice. Make a roux by carefully melting the butter in a small pan. Off the heat, add the paprika and flour, stirring to combine. Return to the heat and stir until flour is cooked, about two minutes over medium-low heat. Bring tomato juice to a boil and stir in roux. If you get lumps, feel free to pour the sauce through a strainer to get rid of them. 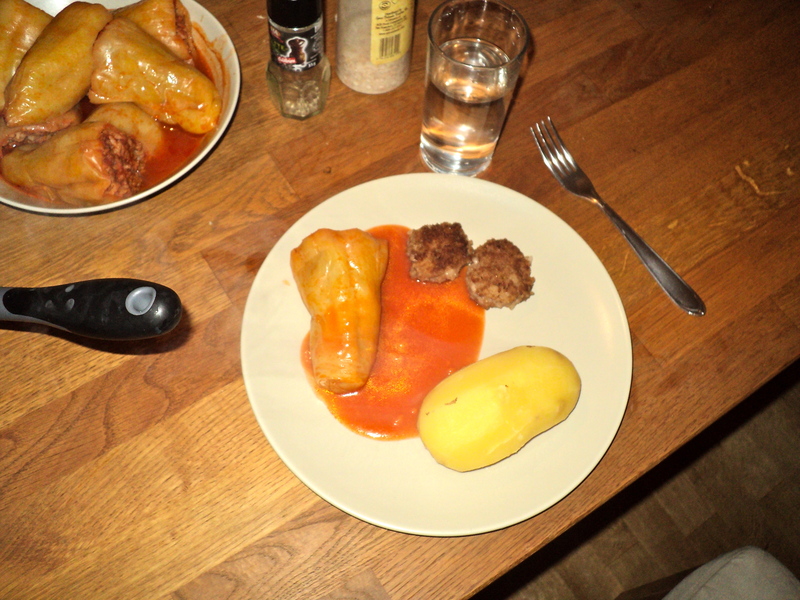 When potatoes are fork-tender (a fork goes in and out with no resistance), drain them and serve with peppers, meatballs, and tomato sauce. Someone who is better at food photography might possibly be able to make cooked peppers look appetizing but I had no luck whatsoever. Please take my word for it though. These are delicious. Ha I misread the title and was confused when no kitten appeared in your story… meatballs are good too. Yum! Can we please cook this when you come back?